My pet's name is Cookie, he is a Greek cat, I don't know anything else about his breed, but he is an orange tabby with white. He is really special to me because I found hm with his three brothers abandoned when they were just two or three days old, so you understand I took care of them, cleaning them and feeding them as if they were human babies. Unfortunately I lost one of them, but the others are all okay and grown up now! One of them lives with my niece and the other one with my sister-in-law. So i really love him, he is special and adorable. It is easy to see what is special about him - his enormous eyes! He is very affectionate, he follows me almost everywhere. He sits on my lap if i am seated, and he sleeps besides me, touching me. He is a darling anyway!!!! Hello, Cookie! Happy Cat of the Day! What a handsome kitty you are! I like your orange tabby and white fur; cute pink nose and your wonderful eyes! Your fur looks so soft - I would happily pet you if I could! Since I can't, though, I hope your caring person will give you some extra pats and snuggles for me. You and your brothers were found when you were just a few days old! Your person cared for you and made sure you were grown up and had forever homes. You are special and adorable! You follow your person about, and as soon as a lap is made, you occupy it! When it is time to sleep, you are right beside your person PURR-fect! I imagine you watch all that's going on with your beautiful green eyes, too! Happy, happy Cat of the Day to cutie Cookie! Cookie is irresistable in every way. It could not have been easy to feed and clean such wee kittens! So sorry that one passed but it still amazing that you managed to save darling Cookie and the other two! You deserve immense credit for pulling that off  Please forward a cuddle to beautiful Cookie, our very special COTD! Dearest Cookie, what a stunning orange-tabby-with-white fellow you are! You are absolutely gorgeous, with that beautiful fur that looks so soft and that sweet face with the cute pink nose and the long white whiskers and those lovely big eyes. My orange-tabby-with-white lady Sparkler says "You're so handsome! Hello, Meow!" Thank you for sharing those great photos with us. They capture your beauty and joy so well! I wish I could reach through the screen and all the way over to Greece to pet you! I can't, of course, but I know your loving and beloved person will pet you for me . And what an amazing story you and your dear person have to tell! He/she found you and your three brothers, abandoned babies only two-three days old. Your person brought you all home and took care of you, cleaning you and feeding you as if you were human babies. We're so sorry that one of your brothers didn't make it, but you and the others are all doing fine! Your brothers have wonderful forever homes with members of your dear person's family. We give our greatest thanks and appreciation and admiration to your person for all her/his hard work and great care and deep love in saving you all and bringing you home! You are very affectionate, and no wonder! You follow him/her all around, and you enjoy lap time and sleeping time together. You love each other dearly, don't you. What a wonderful love-filled home you share! 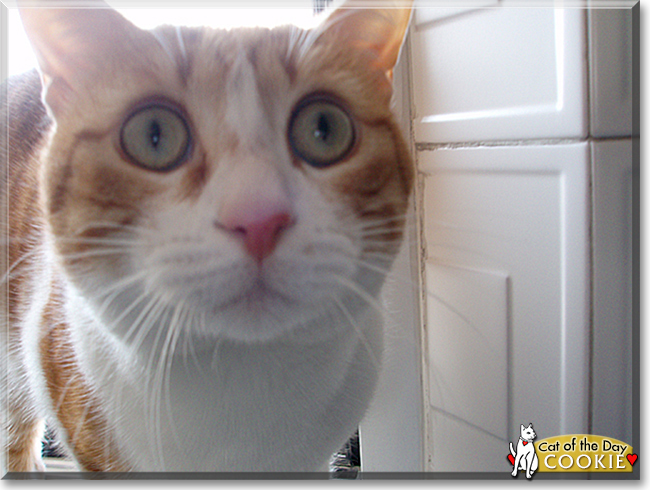 Congratulations, darling Cookie, on being chosen today's Cat of the Day! We hope you and your dear person and brothers and all your family and friends are enjoying a fine celebration, full of fun and lovies and all your favorite games and treats. Aw Cookie, I'm so in love with you and your huge beautiful eyes!! You make your human very happy because you always are around him/her! I'm sure that he/she is now as proud as a peacock because you are chosen to be our COTD! Dear Cookie, what a handsome tabby boy you are. You are so soft looking, and your face with those wonderful big eyes is adorable. I'm sorry that you lost one of your brothers, despite such excellent care. You and your other two siblings pulled through, and each one of you has a wonderful home. As a bottle fed kitty, you are extra affectionate, and you follow your person everywhere, sitting in their lap and sleeping in the same bed. You two share an unbreakable bond. Cookie, you are a precious kitty, and I wish you and your family a great day full of celebration, and many more happy and healthy years together. Hi Cookie in beautiful Athens, Greece! Happy Cat of the Day! My orange kitty loving self swooned at the very sight of you, Cookie! Your orange and white, Creamsicle coat/coloring is so lovely, your saucer sized, jade green eyes gorgeous, and your personality every bit as sweet as your name would have us believe! You sure did have a rough start at life, sweetheart, having been abandoned by your fur mom when you were but mere days old! But blessedly your human came to your and your siblings rescue, doing all in her power to help you survive! I'm so sorry to hear that one of your siblings didn't make it, but so heartened knowing that you and your 2 other siblings grew to be healthy boys and girls; the three of you living happy, love filled lives, all of you staying in the family! How lucky your human is, having a furkid, a best friend and loving companion as special as you! You truly are a treasure, Cookie, beautiful inside and out, simply the best! Thanks for ending my day with a BIG smile, sweetheart! Reading your human's heartwarming tribute, seeing your heart-melting photos, has been a real treat! I hope you enjoyed a very special Cat of the Day celebration...warming your human's lap and snuggling with her under the covers tonight, being loved and pampered to pieces! Lots of love, cuddles and kisses to you, precious Cookie, our very special and most deserving Cat of the Day, EVERY day! What a handsome Orange Tabby you are, Sweet Cookie.